« Did you miss the Taste of the South End? Begun in 1897, the Boston Marathon is the world’s oldest annual marathon and ranks as one of the world’s most prestigious road racing events. In 1967, Kathrine Switzer, who had registered as “K. V. Switzer”, was the first woman to run with a race number. She was a 20- year-old Syracuse University junior who wanted to prove to herself and her coach she was capable of running 26.2 miles. But Switzer took steps no one woman had taken before to run Boston. Unlike other women who had completed the world’s oldest and most prestigious marathon, Switzer had been so brash as to officially enter the race. Switzer never told Boston Athletic Association officials she was a woman; the race application didn’t ask. In those days, the BAA assumed everyone entering its grueling event was a man. But on that cold day at the starting line in Hopkinton, Mass., Switzer’s coach, Arnie Briggs, picked up her race number and she pinned it on her hooded sweatshirt. About three miles into the race, the press truck caught up to Switzer, who was running with Briggs and her boyfriend, Tom Miller. When the photographers noticed a woman in the race with an official number, the cameras started to click. And something clicked inside a BAA official, Jock Semple (one of the race’s top competitors during the 1930s), who jumped off the truck and ran at Switzer in an attempt to tear off her number, yelling at her to stop in the name of the sanctity of the Boston Marathon. Dazed and frightened she would be pulled off the course at any moment, Switzer managed to finish between four and five hours — no one was quite sure of her time. She wore no watch and by the time she finished, all the officials had left. Bobbi Gibb, a woman who ran the race without an official number, finished about an hour ahead of her. But it was Switzer who had made headlines the next day with dramatic photos of her encounter with Semple. 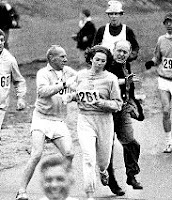 The BAA allowed women to officially enter the race in 1972. From 1970 to 1976, Switzer competed at Boston six times, finishing second in ’75 in 2:51:37. In 1996 the BAA retrospectively recognized as champions the unofficial women’s leaders of 1966 through 1971. Bobbi Gibb was recognized as the first woman to run the entire Boston Marathon. Congratulations to this year’s winner, Lidiya Grigoryeva! – shake well. strain over cracked ice in an old-fashioned glass. garnish with lime peel.